​An “Open Mic” is for popular music only, right? WRONG! 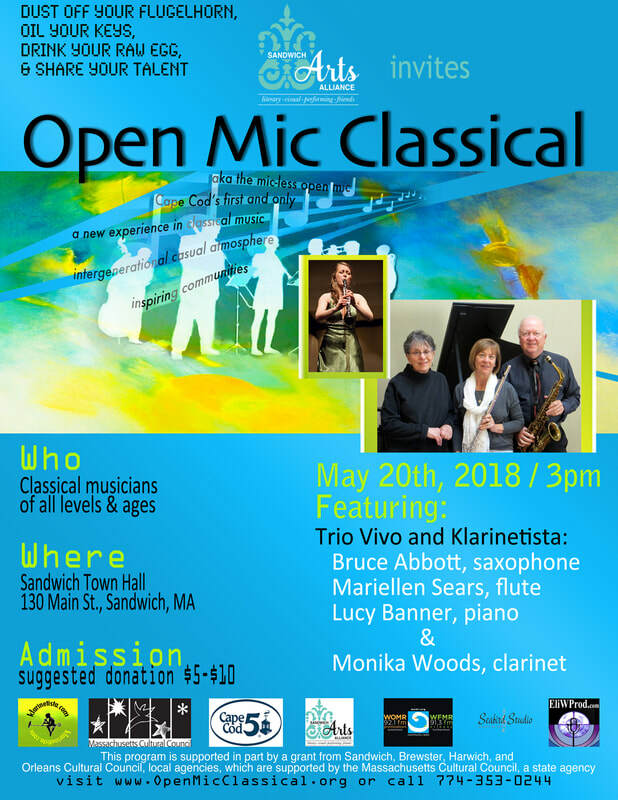 A special Open Mic Classical event in collaboration with the Sandwich Arts Alliance and the help of Amy Lynn Barber will be held Sunday, May 20th, 3:00pm at Sandwich Town Hall. We are bringing you Open Mic Classical, a new experience in classical music, to help our community's musicians share their music with a friendly, and supportive audience, helping them network and foster a community. Are you a doctor with a classical horn habit, or an orchestra member who misses playing in small ensembles? Are you an aspiring young student who doesn't ever get a chance to play with a pianist, but would like to develop your performing skills? Or a composer eager to try out your newest work? Dust off your flugelhorn, oil your keys, drink your raw egg, and come share your talent in an intimate and casual atmosphere. Admission is by donation, and classical musicians of all ages and levels are welcome. Pianist on request is available to accompany you. Open Mic Classical, started 3 years ago in Brewster is spreading its wings, expanding its outreach. ​Interested in performing? Click here for info on being an Open Mic Performer.